April 1911, Washington Park, Brooklyn, and the Phillies’ star left fielder Sherry Magee strikes a serious batting pose, likely taken during the season’s opening series with the Superbas (Bain photo). Coming off the finest season of his career, he’d have a more difficult campaign in 1911, of his own making. 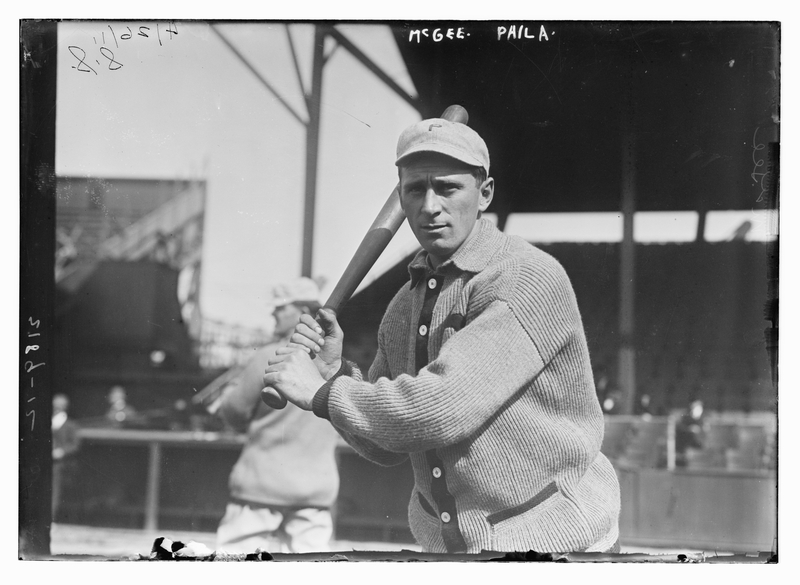 Plucked right off the local Pennsylvania ballfields by a passing scout and inserted right onto the Phillies roster in 1904, Magee quickly established himself as a workhorse who always gave a tough at-bat. And not only was he proficient with the lumber, but he possessed all the tools – he was an excellent defensive outfielder, with a strong arm, and also had good speed, eventually averaging over 30 steals a year in his career (his total of 55 in 1905 was the all-time Phillies mark until 1984), including 21 steals of home. He led the NL in RBI in 1907 along with a .328 average, but in 1910 it all came together. Magee would’ve been the MVP of the league in 1910, if it had existed (the Chalmer’s Award, the precursor to the actual MVP award, didn’t begin until 1911); he led the majors in runs (110) and RBI (123, quite high for the dead-ball era), won the NL batting title with a .331 average, and also led the league in OBP, slugging, and total bases, playing in all but one game of the Phillies schedule that season. Unfortunately, as his reputation as a top ballplayer grew, so did that of his hot-headedness. He’d have 18 ejections in his career, including 4 alone in 1907, which also happened to lead the league; coupled with his opinionated crankiness both in the dugout and off the field, he was less than a fan favorite in Philadelphia despite his baseball acumen. His temper would finally come to a head on July 10, 1911 in St Louis, when, incensed by a called third strike and subsequent ejection for throwing his bat, he punched umpire Bill Finneran, knocking him temporarily unconscious, and nearly causing a larger melee in the process. Magee was suspended for the rest of the season (the largest suspension in MLB in decades), but was eventually reinstated a few weeks later. As a result the Phillies slipped in the standings in his absence, and Magee struggled upon his return, with an overall batting average almost 50 points lower than the year before. Magee did rebound in 1912 and 1913 despite injuries, batting over .300 both years, and the Philly fans turned over a new leaf when he was named team captain in 1914, and, playing a variety of positions due to injuries, rose to the occasion, batting .314 and leading the NL in hits, doubles, RBI, slugging and total bases. However, the good feelings didn’t last long, as he was surprised to be passed over for the manager vacancy at season’s end, and made it be known that he would like to be traded (and to hopefully play for a winning ball club), and the Phillies accommodated him. Then in spring training with the Boston Braves in 1915, he injured his shoulder and was never the same player, his hitting in decline for much of the rest of the decade, although had a short resurgence with the Cincinnati Reds in 1917 and 1918. He struggled through injuries in 1919, but did finally participate in post-season play, pinch-hitting twice and collecting one hit as the Reds beat the infamous White (Black) Sox for the 1919 title and Magee’s only championship, and was released at season’s end. He would return to baseball with a second career as an umpire in 1927, but sadly contracted pneumonia in early 1929, passing unexpectedly at the young age of 44. While Magee’s career was sidetracked by suspension and injury, he is still among the Top 10 in many all-time Phillies offensive categories, resides on the Phillies Wall of Fame, and despite few accolades today, remains one of the top hitters of the dead-ball era.